Regina heavy metal band Kick Axe is keeping pretty busy these days, playing classic rock festivals and recording a new album. The band has recorded about five songs to date and hopes to record more soon, said bassist Victor Langen. "The writing process is collaborative," he said. "We all like to stir the pot until we get something cooking. Someone brings an idea to the table and maybe someone else will suggest something to make the idea better." Kick Axe achieved moderate commercial success in the mid-1980s on the strength of the singles Heavy Metal Shuffle, On the Road to Rock, and Rock The World." "We were living the dream," said Langen. It was the Regina band Streetheart that showed the members of Kick Axe that it was possible for a band from Saskatchewan to find national success. 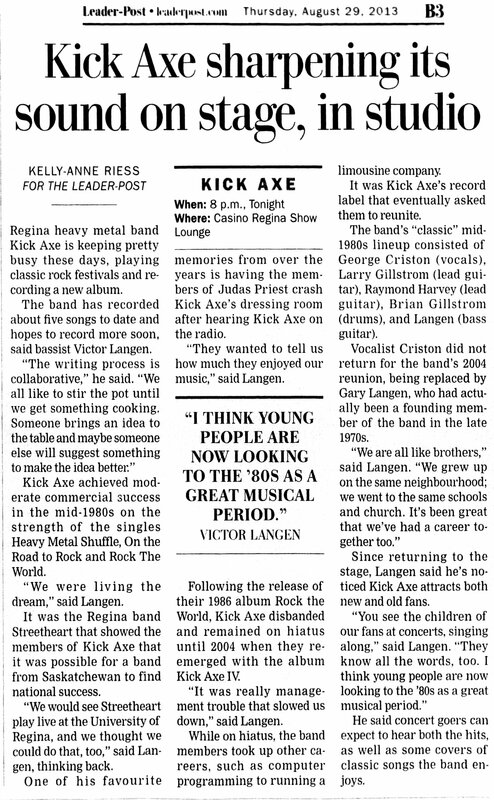 "We would see Streetheart play live at the University of Regina, and we thought we could do that, too," said Langen, thinking back. One of his favourite memories from over the years is having the members of Judas Priest crash Kick Axe's dressing room after hearing Kick Axe on the radio. "They wanted to tell us how much they enjoyed our music," said Langen. Following the release of their 1986 album Rock the World, Kick Axe disbanded and remained on hiatus until 2004 when they re-emerged with the album Kick Axe IV. "It was really management trouble that slowed us down," said Langen. While on hiatus, the band members took up other careers, such as computer programming to running a limousine company. It was Kick Axe's record label that eventually asked them to reunite. The band's "classic" mid-1980s lineup consisted of George Criston (vocals), Larry Gillstrom (lead guitar), Raymond Harvey (lead guitar), Brian Gillstrom (drums), and Victor Langen (bass guitar). Vocalist Criston did not return for the band's 2004 reunion, being replaced by Gary Langen, who had actually been a founding member of the band in the late 1970s. "We are all like brothers," said Langen. "We grew up on the same neighbourhood; we went to the same schools and church. It's been great that we've had a career together too." Since returning to the stage, Langen said he's noticed Kick Axe attracts both new and old fans. "You see the children of our fans at concerts, singing along," said Langen. "They know all the words, too. I think young people are now looking to the '80s as a great musical period." He said concert goers can expect to hear both the hits, as well as some covers of classic songs the band enjoys.